Giovanni (Carlo Cabrini) and Liliana (Anna Canzi) have been sweethearts for a long time. The passion is fading in their relationship, they seem to be driven more by habit than romance. The factory Giovanni works at has offered him a promotion if he will spend 18 months in Sicily to help with a new plant. He takes the offer, and as he goes about his solitary life, his mind continually drifts back to Liliana. This is such a lovely film. Olmi employs truly masterful editing, as memories and reality blur into each other, sound from one spilling into the other. It’s such an impressionistic view, these resonant fragments of thought floating around, drifting in and out of Giovanni’s mind and heart. His loneliness and isolation — even at a wild street party, he’s in his own world — are both a symptom of his yearning for Liliana and a cause of it. The two amateur actors are both splendid in their body language, and their eyes speak volumes. Despite Cabrini’s rugged Jack Palance-esque looks, there’s a sad vulnerability to his demeanor. One of the most poignant moments is his thwarted attempt to join in the late-night antics at the factory’s residential hostel. 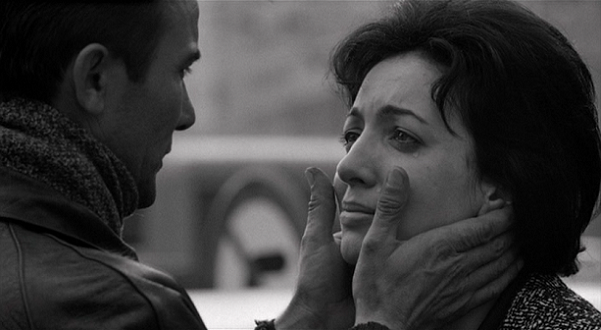 We see less of Canzi, but as the film reaches its romantic crescendo and she reads her letters to the camera, her own vulnerability and humanity is laid bare. The film also provides commentary on how work in the modern, industrialized society takes its toll on family and romance. The people are not used to this high-pressure, fast-paced world where you go to work even when it rains. Where the only shot at getting a little bit ahead is to separate yourself from your loved ones. This entry was posted on June 8, 2013 at 2:45 am	and is filed under Movie Reviews. You can follow any responses to this entry through the RSS 2.0 feed. You can leave a response, or trackback from your own site. This is one of my favorites and I wish more people had seen it. I was actually introduced to it by you a few years ago through Criticker and after checking the description on Criterion’s site ended up ordering it. Have you seen much Olmi? I’ve seen Il Posto which is also strong but lacking the lyrical quality that made me love this one so much. And I have yet to check out The Tree of Wooden Clogs. I’m ignorant of his body of work otherwise. I’ve seen IL POSTO which I also really like, and TREE OF WOODEN CLOGS which is good but tough to get through. Other than that, only a short (LA COTTA) and his section of TICKETS. I believe you reviewed or mentioned this film before, and it’s been on my watchlist since. You’ve convinced me to give this a watch. The story sounds so beautiful and is already touching. I have to get around to seeing it. Thank you!